Thank you so much for being our celebrant on the best day of our lives. You were absolutely amazing both in the lead up with all of the administration requirements as well as on the day, dealing with last minute location and helicopter changes. You were very quick to put your event management hat on and ensure our day ran as smoothly as possible and we thank you for that. It was your calm and relaxed approach that kept my nerves at bay when all of the changes were happening! All of our guests commented on how much they loved the intimacy of the ceremony and this was largely due to what you helped us to create through beautiful vows, inclusion of Peter’s children, and accommodation of our sake ceremony. I can’t thank you enough and will definitely be recommending you to the many people who have asked me about getting married in Queenstown. Thanks so much, we have the most amazing and surreal wedding day. All I remember when being up the front during the ceremony is speaking my vows, looking and smiling at Tim and also looking and listening to you whilst you were trying to keep your folder from flying away in to the pontoon haha! You were a great help at keeping me calm and focused on the task at hand and ensuring I was standing where I was supposed to be standing and saying what I was supposed to be saying at the right time. I knew I just needed to follow your guidance which was a great help and relief on the day, I very much appreciated having you there next to us during our ceremony as we pledged our love and our future to each other. Thanks again for being our celebrant, a very special day for both of us. We had such an amazing day and many people commented at how great you were before the ceremony explaining the unplugged wedding etc. I’ve attached a few photos for you during the ceremony as it was such a beautiful day, might be nice to see. Thanks heaps again and I hope the wedding season isn’t too crazy for you! We just wanted to thank you again for helping make our wedding ceremony so special and memorable. We had such great feedback from our families about the ceremony and you as our celebrant in particular. From our first conversation on the phone, our pre-wedding meeting in Queenstown on that rainy day and the day itself, you were terrific and so easy to work with. We both loved the ceremony and had such an amazing day. It was such a special time for us and we have not been able to stop smiling since! 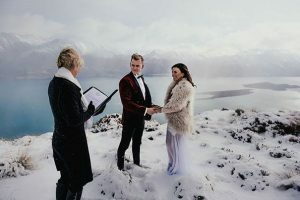 If we know of anyone who intends on heading over to get married in Queenstown, we will definitely recommend you! Thanks again, it’s a time in our life we will never forget. Thanks to Lucy Spartalis & Alastair Innes from “She takes photos and He Makes Films” for their gorgeous photos. Thank you so much for being part of our day! We were so happy that we chose you to be our celebrant, you did such a fantastic job in the very windy conditions! You made Sam and I feel so comfortable and you were so great at guiding us through the ceremony. Your tips leading up to the day about having an unplugged wedding and family seated on the opposite side so they could see our faces were such clever ideas that we are so glad you suggested. Thank you also for the lovely note, it brought tears to our eyes the day after our wedding. Was so lovely. Thanks so much for your help in being our celebrant. We really appreciated your advice and flexibility with trying to work around the weather, and your super friendly and relaxed manner, all of which contributed to the relaxed and fun wedding that was just as we wanted, and the beautiful helicopter flight we will certainly never forget! Thank you for being such a wonderful celebrant, we’ve had endless compliments with regard to our wedding ceremony, which wouldn’t have been possible without you. The reception was fantastic, the venue and band blew us away. The dance floor was packed from the moment Calico played their first song. Thank you again Kathryn, you were brilliant! Fraser and I were delighted to have you perform our marriage ceremony, you put us instantly at ease from the moment we met you. Our family and friends all commented what a lovely ceremony it was and how nice it was to have met you. Thank you so much from both of us, we both had an absolute ball on our wedding day. Coralie and Fraser were married at Stoneridge… happily in love and glad to be married to each other!!! Thank you very much for being our celebrant on our wedding day. You spoke so nicely and made us feel relaxed and happy. Everything went beautifully and it was a gorgeous ceremony. Thank you for all of your help and assistance with all the legal matters. Thank you for your kind words. The day was absolutely amazing and thank you for everything you did. We received several comments from guests who were very impressed with our celebrant …. So thank you!! Thank you for being a part of our wedding day. From our very first meeting to the ceremony itself, you were so friendly and calm and it made us both feel very relaxed. We knew we were in good hands. It also meant we were both able to do what everyone had told us to do – to not stress and just enjoy every moment! Thank you for delivering such a wonderful ceremony, it was just what we wanted. Rainey and I are so pleased with the way the ceremony and everything attached to the day was so fantastic. That is thanks to you for understanding what we wanted and for conducting the service so very well for us. We could not have asked for more from you. Your advice for the wedding dinner was “spot on”! Gantleys was terrific; everyone was very impressed with their meals and wines so we had a long enjoyable celebration night. So “Thank You” so very much for all that you have done. We will never forget our special day and you for making it so special. knowing that you had it all under control. We both feel like you really made an effort to bring our personalities into the ceremony, and the words you came up with were just beautiful and really represented us as a couple. I can’t say thank you enough for everything you did. I just wish it all didn’t go so quickly! Thank you so so much for everything that you did to make our wedding day just perfect! We are still speechless about how amazing everything was and all our guests had the best time and say it was the best wedding they have ever been too (wow!). We met Kathryn on our wedding recce (she was pounding coffee like a mad thing) and we immediately felt comfortable and relaxed. We talked through what was important to us and Kathryn was really supportive and made some great suggestions about how the ceremony could be put together. It all just suited us really well and became a part of the day that neither of us had any worries about (nerves aside…). On the day Kathryn kept us both calm and was confident and extremely professional, but at the same time very warm and friendly. It felt like she belonged as a part of the wedding party, and afterwards we had nothing but great feedback from friends and family. Thanks so much for a relaxed and comfortable wedding ceremony – we both had fun, and wish it could have lasted a bit longer! The whole wedding went great and everyone really enjoyed themselves – gorgeous food at Waitiri by the way! We have just arrived home after honeymooning in the Cook Islands! Thank YOU so much for making Richard’s and my day so special. We are so pleased we chose you to be our celebrant. We wanted to thank you so much for everything. Brendon and I were so very nervous on the day and you had this amazing way of calming us and we really appreciate that. A lot of the information and guidance you gave us on the Wednesday went from our minds and so you patiently guiding us on the day was so great. You performed a lovely ceremony and we really appreciate it. 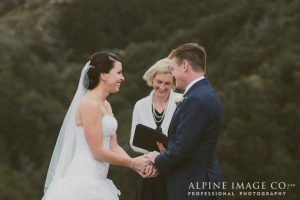 I will be sure to recommend you to all of our friends and family that consider a Queenstown wedding. Thanks so much. We had a number of comments about how great you were. Thank you so much for your amazing contribution to our wedding day! From the very beginning you were so incredibly helpful, despite our appalling lack of preparation! You turned potential major disasters (like forgetting to collect legal documents from the Court) into minor distractions which were easily dealt with. 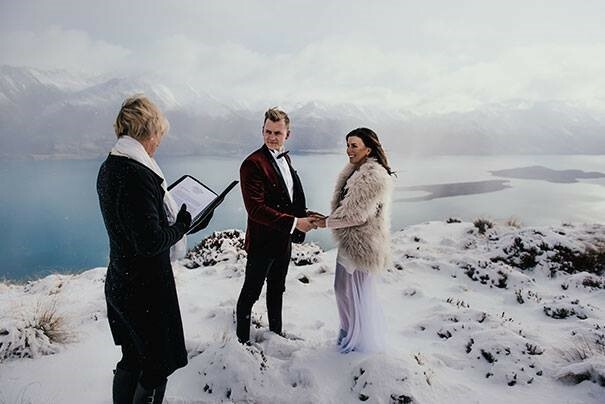 In addition, as we were coming from offshore to get married in Queenstown, your guidance through the NZ marriage process was invaluable to us. You provided excellent suggestions for things that we would never have thought of, and your professionalism, sincerity, and warm approach to the ceremony made our day even more special. It was quite obvious that you had invested a lot of time in preparing for the ceremony, which went flawlessly. The ceremony was beautiful, which can largely be attributed to your contribution. Many of our guests made particular reference to your service, and we are so happy that you were recommended to us by numerous people, including Sarah from Millbrook. Thank you again for helping to make our wedding truly amazing! Mark and I had a beautiful day on Saturday, for us it was Perfect! I don’t think we would have changed anything or done it differently given the chance. Thank you so much for everything. I was really pleased with how the ceremony went and I loved the relaxed atmosphere and the intimate group feeling. You made our day very special. And proved you were very handy with a needle and thread too! Hopefully our paths will cross again somewhere. But my very sincere thanks to you for making our day such a memorable one. I know it’s been a long time since our wedding but I just wanted to say thank you for being our celebrant on our special day. We thought you were wonderful, friendly and approachable, and yet another reason why our day was so perfect. Watching the DVDs we got from Robyn it almost looks like you got a little emotional there after Kelly’s part! Whether you did or not, I can’t help but think that when you regularly share in the happiest day of many people’s lives it’s bound to make you feel good inside. We think you did a wonderful job, and you will always be in our memories of the day that mattered most. I just wanted to thank you for the lovely ceremony you gave Dale and myself last Wednesday. Everything turned out exactly as I had hoped and I wouldn’t change one thing, it was perfect!! I was just looking back through my photos and I saw you fixing my dress. I didn’t even notice you doing it at the time. I was a bit of a giggling nervous bride! Everyone commented on how great you were as well, keeping it light hearted and helping us through it! I wanted to say a sincere and very big thank you for your help and support on our wedding day. It all came together so beautifully and we have completely happy memories of our special day on the 22nd. You were so reassuring and calm for us, and you presented such a wonderful ceremony in one of the most beautiful places – how very lucky we are. Thank you for doing such a great job and I hope you enjoyed your morning with us too. All the best and please look us up when you are on The Sunshine Coast, we would love to take you on a boat cruise to see the dolphins (if you like). Ben and I wanted to express how delighted we were to have you as our celebrant. Your supportive approach was perfect for us, and we found your gentle nature both calming and assuring. Thank you for assisting with the verbiage and working with us on creating the perfect expression of our relationship. We sincerely appreciated how accommodating you were with the ceremony, the setting and the way we chose to celebrate the day. It was fabulous to have had you on the journey and adventure with us, and we especially loved the precision with which you pronounced Ben’s surname! We can’t thankyou enough for your part in our wedding. You were so helpful and patient the whole way! We had such a brilliant day, despite having to go to our plan B. It really could not have been more perfect for us. Thanks again for everything. And, we’re glad to hear that you made it to the Earnslaw (just J). Thank you so much for everything, we had a wonderful day and we are so glad that you were there as our celebrant, it made the day just perfect! Thanks again for all your support and kind words. Thank you both so much for making our wedding day the special day that it was. It was such a beautiful ceremony, setting etc and we are so grateful that you were there to help us on the day. Thank you so much for this. We loved the Ceremony you gave us and are sooo happy with how the wedding went. Raewyn and I are very keen to come back to Queenstown (as always) and would love to catch up with you for coffee in one of the great cafes down there. Finally getting around to this email to thank you sincerely for your great assistance in the planning and during our wedding last month. We and our guests had a fabulous time and that was in no small way due to your most pleasant manner in professionally conducting our service. We could not have wished for anything better. We left Queenstown on a high and with warm and lasting memories. A couple of photos are attached. Your part as our Celebrant was an integral part of our Queenstown wedding. You made both of us feel so relaxed and we felt that we already knew you when we first met. Thank you for helping so much with being flexible on our wedding day it really made such a difference to our day. We are so happy and the ceremony was lovely. It really worked out perfectly in the end. Thank you for a fantastic wedding ceremony! Loads of people commented on how relaxed it was and how well you spoke. Sorry for taking so long to reply back to this thank you for the information but most of all thank you for making our day so special. You calmness certainly helped and made everyone feel relaxed especially us, all I can say is I can’t thank who ever invented waterproof mascara enough! Once again many thanks for helping us to create such a wonderful day. We wish to extend our huge thanks for your special part in our wedding ceremony. We had the most perfect day and our ceremony was exactly what we wanted. Our family and friends really enjoyed the way our ceremony reflected our story and who we were as a couple. We loved your professionalism and your ability to work with us on putting the ceremony together – some of those suggestions were great and helped us very much in deciding on how to word our ceremony. The printed prompts on the bits of card helped us too and made lovely keepsakes.